November 26, political prisoner Oleksandr Kolchenko turned 28. 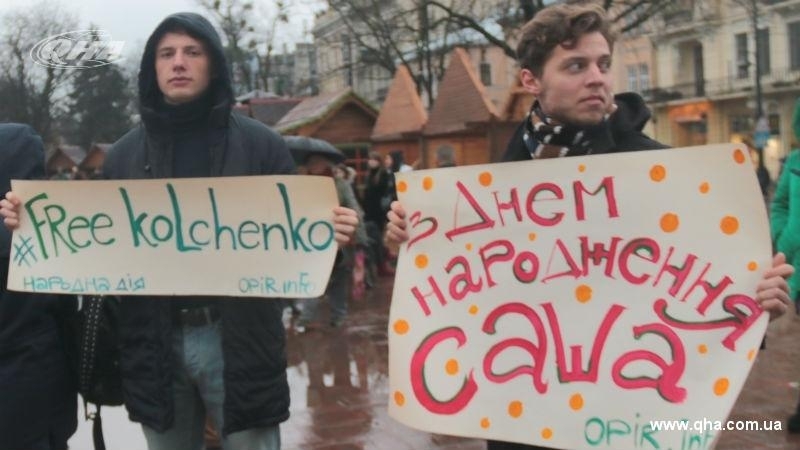 On that day, an action was held in Lviv in his support. Although now he is in prison near Chelyabinsk, RF, he will soon learn that he is not forgotten in his native Ukraine. As part of the event, activists signed cards with wishes to Kolchenko and informed passers-by about the terrible statistics of political prisoners, which due to the Kremlin's aggressive actions can not be accurately calculated: According to various sources, from 45 to 60 citizens have the status of a political prisoner in Ukraine. The Crimean acquaintances of Oleksandr, who moved to Lviv after the annexation of the peninsula, came to the action as well. “I learned about the action literally today and immediately decided to come and support my fellow countryman and my acquaintance Oleksandr, I wish him to find himself at liberty as soon as possible," said Oleksii, an internally displaced person. The organizer of the action Irina Yuzyk is convinced that such events are necessary and help people in isolation not to lose touch with reality. “We have gathered to convey our good wishes, as well as send Ukrainian-language books to Sasha [Oleksandr Kolchenko – Ed. ], because he's all alone there. Of course, FSB will not allow any modern Ukrainian books about the Maidan or the Revolution, but there is an eternal Ukrainian classics and world classics in the Ukrainian language, which we will send to Kopeysk. Reference: Oleksandr Kolchenko is a public activist of environmental and trade union organizations, supporter of anarchist views, an anti-fascist, participant of pro-Ukrainian protests in the Crimea in the spring of 2014. May 16, 2014 in Simferopol he was arrested by the FSB of Russia on charges of setting fire to the offices of "United Russia" party and "Russian community of Crimea" as well as plotting an explosion near the memorial of the Eternal Flame. The same month he was taken to Russia in Rostov-on-Don. At the court sessions Kolchenko was tried along with the filmmaker Oleg Sentsov, under the same charge - terrorism. Both did not cooperate with the investigation.